This activity is part of the Conditioning Hiking Series - Seattle - 2017 course. To register for the course, register or cancel lectures and field trips, or cancel entirely from the course, visit the course page. Bothell Park and Ride, 10303 Woodinville Drive, Bothell, WA @ 7 AM. Look out for a silver Impreza hatchback with the hatch up. There are conflicting reports on whether this is a 9.1, 10, or 11 mile hike. I will post this as a 10-mile hike but please be prepared for an 11-mile hike, just in case. As described on the Hike of the Week website (dated 9/10/10): "One of the finest ancient forest hikes within the entire Alpine Lakes Wilderness, Deception Creek is also one of the least hiked trails in that wilderness. 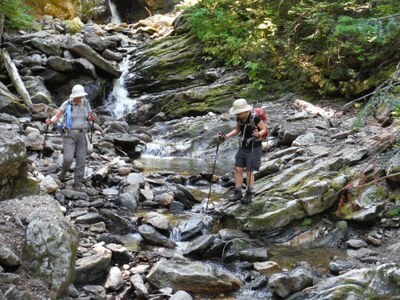 Passed over by hikers preferring mountain summits and alpine lakes, this trail is perfect for those who enjoy solitude, quiet contemplation and big old trees—and of course a gorgeous cascading mountain creek as well!"